For a home that incorporates large areas of glass, you should consult an architect. The reason is that some of the glass areas that you wish to incorporate might be load-bearing areas. The same applies to large windows that cover a large area of a wall. The load-bearing issue is especially true for your façade. It does add to the homely feel of the home as it lets in a lot of natural light. If done right, glass adds to the aesthetic of the home. Added to this are materials – including types of glass – that can provide privacy for the home even though it is an open area. Following are a few examples of home designs that incorporate large areas of glass. Modern homes often utilize large areas of glass. The first example shows the large areas that the glass occupies. This illustrates the need for an architect to create the planning of the structure, as the glass areas become the walls. This is an ideal design for the Malaysian climatic conditions, as the glass areas include sliding doors to open onto the garden areas. The glass areas could be tinted or one could use color coordinated blinds to let in light, and keep out the brighter sunlight. The blinds are also useful for privacy. 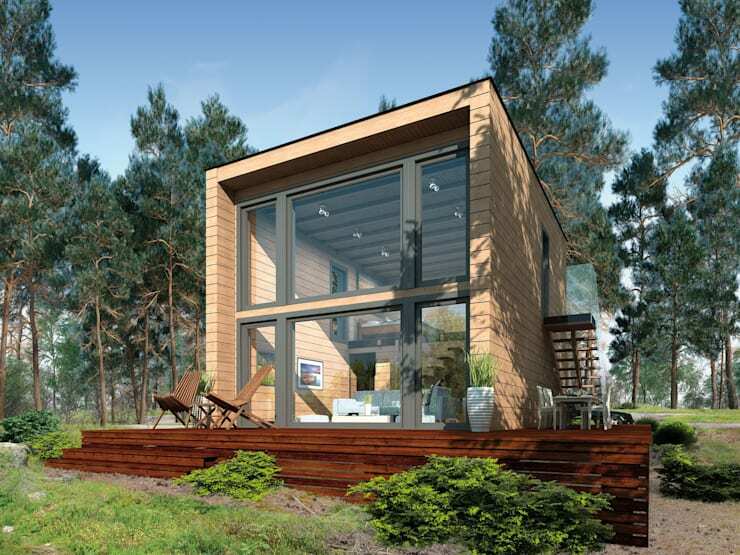 You are able to install a prefabricated home, with completed sections, directly on site. Glass gives an otherwise dull design an extra elegance. This example could also fall under the simple elegant style, and it has to do with the way in which the designers incorporated the glass. This home opens itself to nature. To achieve this, there are large glass areas, and the sliding doors can open onto the outdoor area. Another example of housing where glass form a large part of the design, is the glass and steel type. This is also part of modern design, and consists of steel frames with glass in-fill. This design incorporates different sized steel areas, in filled with the glass sheets. These glass areas are in place of walls and should therefore be of a specific type of glass, that is, strong enough to be loadbearing as well. Bungalows conjure up unattractive buildings from the 1960s. Modern bungalows are much more attractive, designed and styled by architects. The example shows such a modern example that has a complete wrap around glass area interspersed with timber. This is an excellent example for indoor-outdoor living,. The large glass areas let in sunlight, natural light, as well as the outdoors in. It gives the sense of peace and calm. 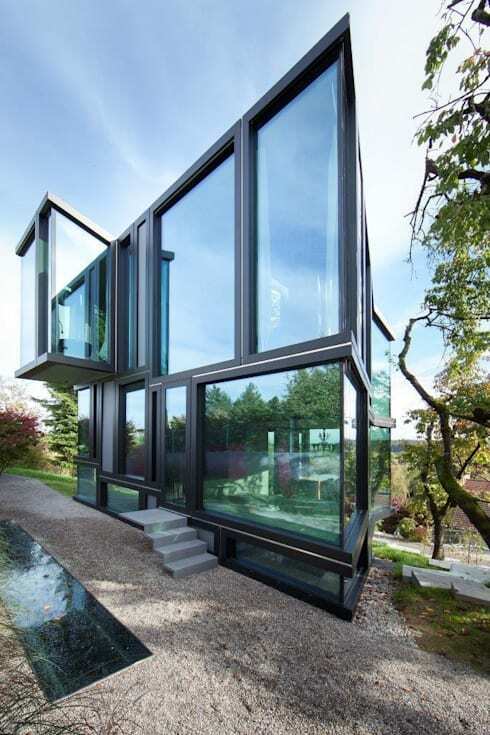 This is an excellent example of a glass home. The design lends itself to an excellent use of glass, especially reflective glass (more specifically glazing), which allows for privacy. Once again, only an architect should attempt this type of building, as most of the glass areas are loadbearing areas. Concrete floor slabs also separate the steel structure into two storeys. The houses under discussion here deal with glass as the main element. However, one could also mix glass with other materials such as in the next example. Here glass areas fill in the concrete walls of the home. The architect used the glass in an innovative way, further framing it with timber as well. The two shades of grey of the concrete walls add to the glass elements – almost in a reflective way. 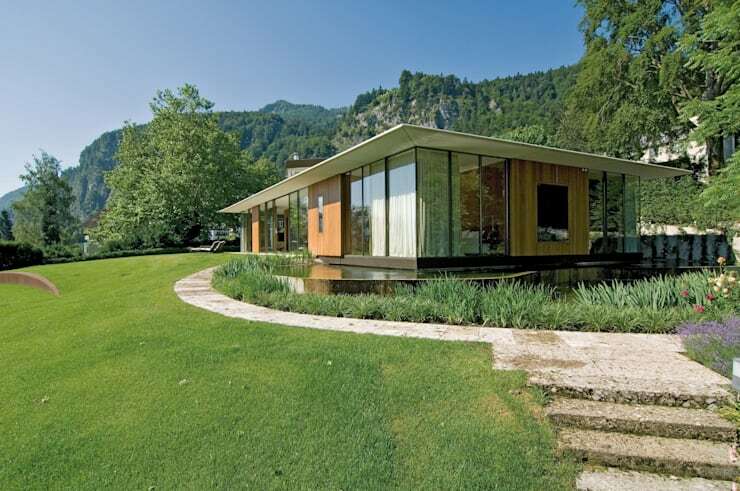 This example also emphasizes the fact that glass does not only need to be square. Residential buildings do not have to be plain, and the extensive do not need to be as expensive. One can make a change to the façade of a home, by simply adding a glass extension. By adding a high, vertical element in glass, the façade would have an immediate update and change. It would also save on land area, especially on a small plot. What this means for the home is that it would also be flooded with light, and opens it up to the garden area. This will create warmth and calm to the home. This house is a very good example of what modern design is about. It has hard, contrasting concrete areas, juxtaposed with beautiful tinted glazed and reflective windows. The glass areas are also loadbearing with steel framing. The glass allows the natural garden around to become part of the inside of the home. Several glass homes use concrete, glass, and steel. This example shows a different mix of glass, concrete, and timber. It definitely creates a different look to the home. The contrast between the concrete colorings is more drastic – white and dark grey. The glass creates the binding element between the two storeys. The glass allows for a beautiful view from the top storey. Both areas – ground floor and upper floor – utilize the glazed areas quite well. Incorporating glass in this way, gives access to the garden, which adds to the peacefulness. As long as your home is not under heritage protection, you are able to bring updates to your home. In such cases, it is a great idea to extend the home, or change the home with glass elements. A glass façade, with double volume glass, can give your home an imposing look. 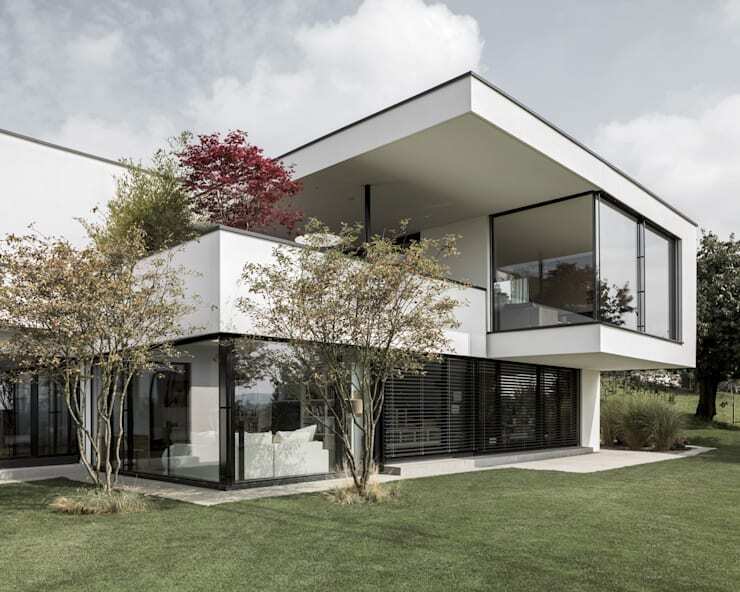 The example shows how an old villa can be extended using glass and concrete to bring it right into the twenty-first century. Warm indoor lighting can create a very opulent feel to the home. Daylight pours into a home with large glass windows creating warmth during the day. Even the smallest homes can make good use of glass in its design. 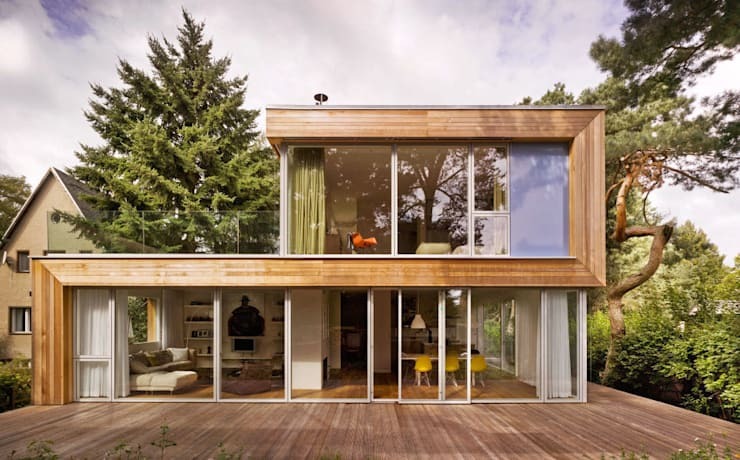 One of the examples is the home that makes use of timber in modular format. Parts of the building come complete from the factory, and the contractors assemble it on site. Once assembled, they add the large glass façade. A small home with a large glass façade, can immediately give the impression of a much larger space. It allows in natural light and nature and adds to the peace and calm of a very relaxing home space.